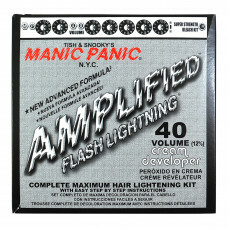 This Manic Panic bleaching kit was designed for pre-lighting hair before using Manic Panic hair dyes. Everything you need to bleach your hair is included in this kit. Please ensure you follow the instructions carefully, we strongly recommend you perform a strand test prior to applying this product to your hair. Wearing the enclosed gloves, open the bleach sachet. Avoid inhaling powder. Empty full contents of bleach powder into the provided tub. Gradually add the developer to the bleach powder in the tub. Using the brush, blend until the mixture is smooth and creamy. Sometimes it is not necessary to use all the contents of the developer. Apply mixture immediately. Do not wait a long time. Hair should be dry and unwashed. Using the provided brush, apply the bleach mixture evenly to hair you wish bleached. All strands should be saturated using the brush or gloved finders to spread the mixture evenly. You may mask hair you don't wish to bleach by using a highlight cap or foil. When desired shade is reached, take off the cap and throw away. Shampoo hair thoroughly. Rinse thoroughly and towel dry hair. These instructions and additional instructions can be found on this kits packaging including further information on developing the bleach and performing strand tests.